There is a tradition, of sorts, here in Phx-land area to go tubing down the Salt River. I’ve been here a few years now, and up until yesterday, hadn’t partaken in this event. Yesterday, I had the opportunity to go with a few friends. I had some little trepidations about the heat. Last year, I did corner working (no, not that kind of corner working) in exchange for track-time on my bike. I rode the first half of the day, and started my stint at Firebird Main as a corner worker early in the afternoon. This is Phoenix, folks. It was ridiculously hot. I had been drinking as much Gatorade and water as my body could hold, but sweating for five hours in full leathers probably didn’t help the situation too much. I got scootered out to my corner by one of the organizing staff. I sat in the little blue chair that had a small canopy for one session. My flags were in hand and I knew how to use them. I sat down and it felt like my legs were burning off. I covered them with the flags and drank more water. I started to feel a little dizzy, so I used my walkee-talkee to request to be brought in so I could use the restroom. Scooter-guy came and got me and the breeze felt great as we zipped in to the pits. I took my bathroom break and zipped back out to my spot. Scooter-guy left to bring me more water for my cooler. By the time he zipped to the pits and back, I had started to feel that telling shiver and woozy feeling of heat exhaustion. Scooter-guy scooted me back in and luckily I had a friend of a friend with an air-conditioned trailer. My body did not want to take in any more fluids (not a good sign), so knowing that I also needed salts, I ate some chips. It took me a couple of hours before I felt stable enough to leave that trailer and ride home. I was useless the rest of the day. I had never felt that way before, so when my friends suggested I spend four plus hours sitting in a black rubber inner-tube, belly up to the hot August sun, I got a little nervous. The saving grace of the whole tubing experience is that the river water is cool, so that keeps your body’s core temperature down. Provided you lather yourself with sunscreen adequately, and drink a lot of liquids, it should be a fun experience. Fun it was! And beautiful. I have enjoyed many a kayak down a secluded and isolated river. Those tend to be somewhat serene and relaxing trips. (Even the one where the goose tried to steal my shoe), this was altogether different. It was still relaxing and a very enjoyable time, but rarely was it serene. There is a whole culture and social dynamic to the tubing on the river. You are not there alone or just with your little cluster of friends. There are many, many other clusters of tubers rolling down the river around you. The lure for abandoning ship is often the prospect of jumping off a rocky outcropping or perhaps chasing an escaped can of beer. We have our priorities on the river. We saw a lot of animals on the river. 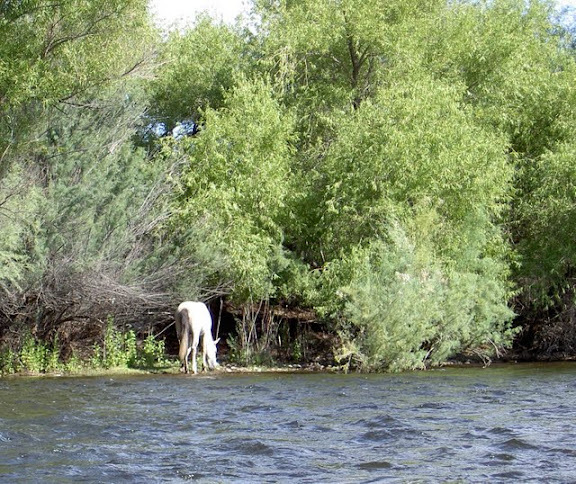 Most of whom were drinking Coors Light…but we had a lucky sighting of a wild horse on the riverbank. Our little group of five people, two coolers and seven tubes, provided to be an excellent mix. I applied sunscreen liberally and my milky-white skin survived with a healthy pinkness and burn-free. I can’t believe it took me this many years to do this. This entry was posted in fun, road trip, silliness by hoyden. Bookmark the permalink.